Produces nearly round, medium sized melons. Flesh is bright orange and very sweet. An established garden variety, especially in the Northeast. Muskmelon Delicious 51 is resistant to Fusarium Wilt. Mulch to control moisture and water heavily when bearing flowers and small fruit. Feed every here to four weeks. 1000 Seeds/oz. Plant 1/2oz per 100ft row. 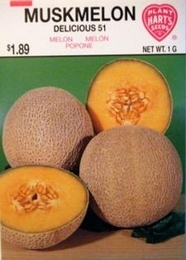 3lbs of Muskmelon seed needed per acre. On average, 1oz of seed can produce 1000 Muskmelon plants.